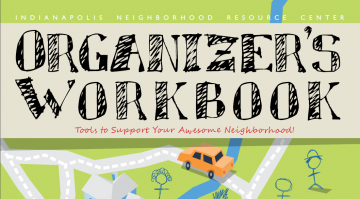 This is an easy to follow guidebook full of practical tools to help you and your neighbors organize as you work together to develop your vision of an awesome neighborhood. Indianapolis neighborhoods are great places to live, work, and play. As our neighborhoods continue to grow and change, we must continually work together to nurture new leaders that step forward, building upon the resources that already exist in each of our communities. Through this work, we are encouraging all of our neighbors to play an active role in designing the future of our community. The goal of this book is not to tell you to "fix" neighborhood problems, but to demonstrate how to recognize the assets, to provide the lessons and to empower our communities so that we can build our communities and neighborhoods for ourselves. As you explore this workbook, you’ll read about neighbors from across this city, connecting with one another and making real, lasting change in their community. We’ve heard from neighbors literally across the globe who have found this book helpful as they work with communities. We hope you enjoy our 3rd edition of the Organizer’s Workbook. It contains additional information about tools, as well as updated stories about Indianapolis neighborhood successes. Please keep in touch, share your stories, successes and expertise! And remember -- all along the way throughout your journey, INRC is here to help! Please don’t hesitate to contact us at 317-920-0330 or at www.inrc.org for support to more tips, coaching, best practices, and more, as your neighborhood moves from good to great.